I know I’ve been wrapping the season with several contests, which probably isn’t exactly the kind of heavy-hitting football analysis you crave, but…well, it is Super Bowl week. The guys from Rules of the League shot me an email this week about this contest, and considering the prize is a shiny new TV that you receive in time to watch the Super Bowl this Sunday, I couldn’t pass up the chance to tell you all about it. Of course, you can help the Fantasy Football Fools out as well when you enter the contest, as you’ll read in their explanation of the contest below, exclamation points and all. But for the CliffsNotes version, just tweet out the text in bold below and follow @therulesdottv on Twitter for a chance to win a TV. See? Easy. Not only will you be endeared in the hearts of…well, me…forever, you also might score an excellent TV to watch Peyton Manning and Drew Brees compete to hit 400 yards by halftime on Sunday. And be sure to tweet now. The contest ends on Feb. 4 (tomorrow) at 9 a.m. P.S.T. Check out Rules of the League web comedy over at http://therules.tv. 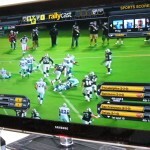 Win a 52″ LCD TV? No Way! A winner will be chosen at random from all the people that participate. Holy Crap! A Spot in the Show, too? The winner of the contest also gets to appear in Season 2 of Rules of the League. Yes! You heard right. You get written into an episode of the show next season. See the #hash tag at the end of the twitter message above? That means you’re helping your favorite blog get written into the show, too. The blog with the most retweets also gets a spot in the show. Awesome! All you have to do to enter is retweet the message above. A couple of weeks ago, I got the chance to play Buzztime Fantasy Football. If you’ve never played it at your local watering hole or seen it in real life before, it’s much like the trivia games you’re used to seeing at sports bars and restaurants. In order to play, you have to get a keypad console, or Playmaker, from the establishment that allows you to login to your Buzztime account and participate in the games that are scrolling across the various Buzztime-dedicated TV screens. Like many of the games I’m sure some of you are seeking this time of year, Buzztime Fantasy Football allows you to pick an entirely new team every week. Just like college graduation, your past defeats no longer continue to haunt you like they would with a traditional fantasy football team after a poor draft. Each week, you select two quarterbacks, two running backs, two wide receivers, one tight end, one kicker, and one team defense as well as a tiebreaker question. Buzztime gives you five players to choose from for each position, and once your picks are entered, you’re good to go. The onscreen experience enhances your pick selections by running through player stats. I would have liked more side-by-side comparisons or a commentary provided in video format about each of the players, but in a busy bar environment, the Buzztime selection screens worked for what they are. It was a little nerveracking to select my team on location at Buffalo Wild Wings, which I chose to draft at because I’m a company man like that (Buffalo Wild Wings had me participate in their All-Star Bloggers League this season). I brought along some friends, which made the evening more enjoyable but added an extra layer of difficulty to selecting players. Between each position pick for your team, there’s a break. That could sometimes lead you to forget about selecting your next player, but the Playmaker does beep at you to let you know it’s time to get your head back in the game. If you came to your local Buzztime location ready to do some serious drafting and with a few fantasy football friends in tow, I don’t think you’d have as much of a problem. If you do miss anything, as an added bonus, you can always login to the online site, Buzztime.com, to make picks that you left blank or change your picks before the games start. Luckily, I found that it wasn’t too difficult to make your pick if you know your fantasy football, but the player selection is no cakewalk. Buzztime creates an interesting mix, not just the top five at each position or the most highly projected in any given week. You have to know when there are favorable opponents for a fantasy stud, which the Buzztime stats help you see, but you often have to make a call between a stud and a sleeper. Buzztime.com and the mobile site, Buzztime.com/m, allow you to track your scores and see how you stack up each week. I was impressed that Buzztime had the mobile site, especially considering sites like Yahoo! and Fleaflicker still haven’t caught up to ESPN’s mobile offerings when it comes to fantasy football management. I found myself more involved in my ESPN leagues this season and more comfortable tracking scores from my phone thanks to their mobile sites — although an application for Android phones would be great, whichever one of you big guns wants to make one first. It’s clear from Buzztime’s mobile site offerings that they have thought about accessibility, and I like that. You don’t have to go to a restaurant or bar that has the Playmakers available, but they certainly do make it more social and sports bar-friendly. While the Playmaker itself leaves something to be desired, it’s not bad. So it’s pretty much just a keyboard with a two-tone green-on-black input screen? So what? The real visuals here are the TV screens that show you the players that you’ll be selecting. You’re just inputting numbers into the Playmaker to make your selections. If you want more aesthetics, they do have that mobile site I just plugged. It’d be nice if there were more times available to draft your team “on location.” The Buzztime locations I found all offer fantasy football selection times several times on Wednesday nights, but no other nights of the week were available. As long as you plan to be there on time, you’ll be around for the selections, and even if you miss it, you can always put together your team on Buzztime.com. But it’d be nice if I could do it on Thursday night before Thursday Night Football begins or on Monday, right after the Monday Night Football game has ended. For those of us who can’t frequent sports bar establishments, it would allow us to maximize our football watching time. Then again, maybe we deserve an excuse to go out with some fantasy football buddies on a Wednesday night? Overall, if you’re looking for a fun way to relive the fantasy football draft throughout the season, or if you need a fantasy football fix when your playoff hopes have run dry, head down to your local sports bar, restaurant, or watering hole and try out Buzztime Fantasy Football. Use Buzztime’s Site Finder to find the location nearest you equipped with Playmakers. As an added bonus, after selecting my players on the Playmaker, I used it to enjoy some football trivia. The questions weren’t your typical “going to commercial” tossups that you see during football broadcasts. They were tough, but Buzztime keeps it interesting by providing clues, the last of which would often give away the answer for lesser sports fans with logic skills. Buzztime also offers an interesting game called QB1, where you try to predict the play just before a team runs it. I might have to give that one a try next time I’m in there on Sunday. Even if you don’t get a chance to try out the fantasy football game this season, the trivia and other games are worth battling in next time you’re out and in need of some midgame entertainment. And it’s hard to beat the price. All of Buzztime’s games are free. If you’ve played Buzztime at your local house of sports, share your thoughts in the comments. I’m interested to see what others think of the games and the experience. Full Disclosure: Buzztime covered my visit to Buffalo Wild Wings to experience the Playmaker device and play some Buzztime Fantasy Football (http://cmp.ly/2). No wing sauces or Playmakers were injured in the writing of this review. So you’re prepping your team for the final push, but you’re worried you need a couple more warm bodies? Well, that’s not a problem. That’s what a fantasy football roundtable is for. Waivers are about to close in some leagues for the playoffs; who should we be grabbing for the final push? Two players that I’d grab for the final playoff push are Mike Bell and Mohamed Massaquoi. There are far better options out there if you’re making a playoff push, but I’m assuming that both of these players would be available in most leagues right now as free agents. Bell has been vulturing touchdowns from Pierre Thomas throughout the season, and while I’d hate to rely on him in a critical playoff week, if you were forced to start him, I wouldn’t consider it the end of the world. Bell has a chance to score in every game the Saints play from now until the end of the season, and he’s been the closer for the Saints in games they put away early. Massaquoi is part of one of the most miserable offenses in the NFL. Luckily, he gets to play two of the most miserable defenses in the NFL in Weeks 15-16, the Chiefs and the Raiders. If you need a desperation play wide receiver for Week 15 or 16 due to injuries, Massaquoi might just do the trick. In deeper leagues, he’s worth considering for a WR3 spot those two weeks. For all this week’s entries to the Fourth & 1 Debate, check out the complete fantasy football roundtable at Hatty Waiver Wire Guru. 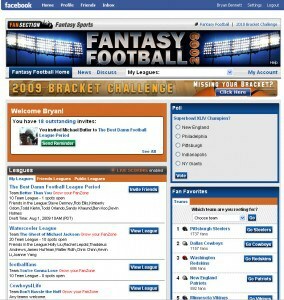 The Fantasy Football Librarian, one of the best fantasy football bloggers out there and one of my competitors in the Buffalo Wild Wings All-Star Blogger League, has a readers’ choice poll going on to determine the best fantasy sites around the Interwebs. If you like what you see here (and I hope you do) on a daily basis, head on over to take her poll and vote for Fantasy Football Fools. We anxiously await the results, but as long as we finish second-to-last or better, I’ll consider that a win. Just like the Buffalo Bills. You can find the poll here. As always, I appreciate your support. Now that you have your fantasy football team drafted and ready for action, you should be looking for any way to get an edge on the rest of your league. Besides subscribing to Fantasy Football Fools, another great way to stay in the know is by signing up for player news alerts. Top Fantasy Football recently contacted us to offer one free subscription to their Dominator Service to one lucky Fantasy Football Fools reader, and we decided to make it happen. It is, after all, a special day — 9/9/09, the final day before the regular season begins. Keep reading to find out how to enter. Their Dominator Service sends out updates about waiver wire pickups and notifications on up to 20 preselected players of your choice. You also get injury news and game day weather updates to save you time on your research each week. It’s really much less like “The View” than I just made it sound. You can see everything that comes with the dominator service at Top Fantasy Football. To enter to win this free service for the 2009 season, all you have to do is leave a comment on THIS post, and, in your comment, tell us why you need to win your fantasy football league this year. Comments that do not include an explanation of why you deserve the Dominator Service this season will not be considered. Note: Humor will be taken into account when choosing the winner of this contest. While the most important thing is to leave a comment with a reason, the more entertaining your comment is, the better. For example, explaining that you need to win because your leaguemate recently stole your lunch money, your girlfriend or your job will win you special bonus points. We have a soft spot for revenge tales. On Thursday night (or Friday if we have to wait for a few more comments), we’ll select a winner based upon how much we liked a particular comment and how many “likes” it received within our new Disqus commenting system on this post. 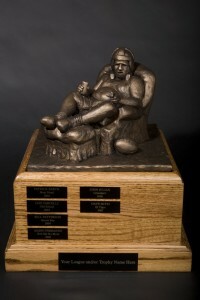 The winner will be notified and setup within the Dominator Service system by Top Fantasy Football. So that’s it. Make sure to get a comment posted by Thursday night. That’s tomorrow! And don’t forget to subscribe to receive our updates from Fantasy Football Fools while you’re at it. Make your stories good, but try not to make anyone cry, okay? After watching Seven Pounds this weekend and talking to OU fans, I don’t need to see any more tears this week. UPDATE: Brian is our winner. Congrats, Brian! Now he gets to overcome having just one keeper in a three-keeper league. Ouch!